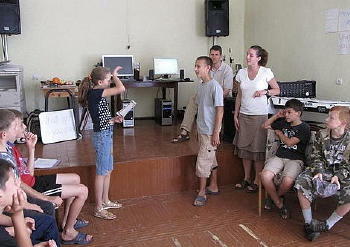 From July 5 to 17, 2009 a LifeNets delegation of Dan and Cindy Harper and Ken and Cherie Zahora taught English and helped with a day camp in Vinogradov, Ukraine, for the second year. We learned several lessons last year, not only about curriculum, but about culture, schedules and the children themselves. Unlike last year, this year Victor Kubik was with us the first week, which was a huge plus as he speaks Ukrainian fluently. We only had to ask, “Now what’s happening?” And we got answers. He translated the daily Christian living classes, which followed the theme of the week of creation. This year two classes were taught simultaneously in adjacent buildings. Ken and I taught 18 to 20 beginners with the Genki program of pictures, video, gestures and song. Dan and Cindy Harper taught the next level of 20 children, who had a smattering of English already. They learned additional vocabulary, conversation and even delved into pronouns. We came armed with very clearly outlined curriculum maps prepared by Cindy. The children then had free time to jump on the trampoline, play volleyball, badminton, Ping Pong, swing, bounce or kick balls around. They also had 30 to 40 minutes of Christian living class with lots of singing. Then it was time for lunch with more free time, then off to an excursion that included some type of swimming in a river or lake. We interacted with the children in all these activities, encouraging them to use the English they were learning. The children, many of whom come from difficult family backgrounds, are growing in many ways. They are calmer than last year. We could tell all the patience and hard work of surrogate “parents” Vasya and Maria is paying off. All of the love they receive from the Polichkos is showing results in their lives. We were surprised how much English they remembered from last year. 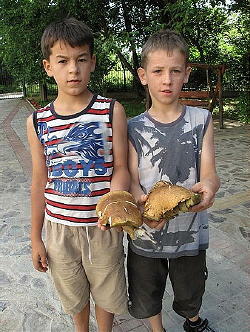 The seven boys that live with Vasya and Maria Tomaschuk also receive two hours of tutoring in English a week. Yuri, age 7, had difficulty at first fitting into the group. The first two days he did not attend class, but played alone in the yard. Ken invited him to join us and he sat in the back of the class, but did not participate. As the days wore on, he moved closer to the front and was totally engaged. He joined in with the other children, and even played the games with them. The socialization and acceptance motivated his participation. LifeNets was able to supply four new robust computers to the ESL program and the Rosetta Stone English-language software was networked to these to create a lab for English lessons. This program is very interactive, using headphones and microphone to listen, look and speak. The children could not wait to try out these lessons, even before Dan totally had it all installed. 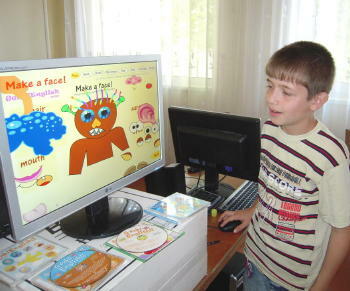 One of the boys had difficulty speaking the word women and the computer would not accept his pronunciation. He listened carefully and repeated the single word almost 20 times, but he did not give up. The next day one of our students ran to me in the yard and beckoned me to come with him. Vladislav had sent him to get me, so he could show me that he had scored 100 percent on his lesson. I snapped his picture, and he was very proud of this achievement. We can’t wait to see how the students progress with this new tool in the next year. Some of the children come from the immediate neighborhood and love to stay at the mission as long as they can. They go there to sing, pray, work in the kitchen and enjoy the warm company of the Polichkos. They wash dishes, serve the other children their meals and mop the floors at the end of the day. The mission provides light in so many ways: food, shelter, Christian foundation, love and hope for a brighter future.